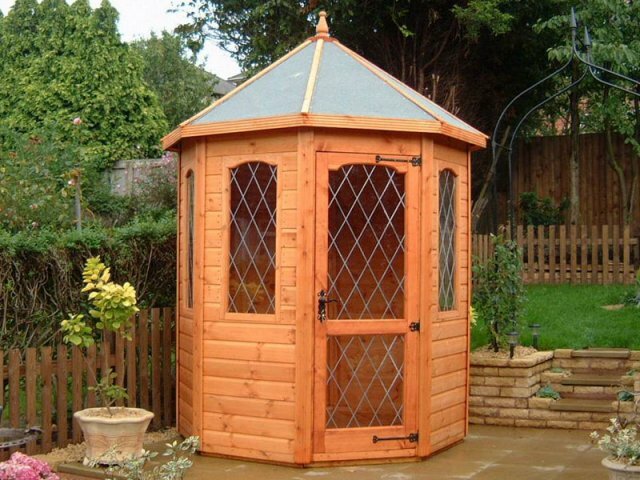 The Bromley Summerhouse is a pretty garden building, designed in the octagonal style. This shape helps it to fit neatly into a corner, and subtly enhance your garden without being overbearing. The fully glazed door and four fixed windows are diamond leaded to give an elegant feel to the building, and the pyramid shaped roof provides plenty of head room inside. The Bromley is a truly elegant building measuring 6x6. It has the option of a cedar cladded roof if required.